This holiday season I sewed along with Tilly of Tilly and the Buttons and a bunch of other talented seamsters in the Crafty Christmas Club. We all made gifts for our family and friends, and, now that the gifts have been opened, here’s a reflection on my efforts to sew well. My mom asked for a cape for Christmas, and I was happy to oblige. In fact, I thought I could draft a cape pattern that would fit her perfectly using the simple directions in Patternmaking for Fashion Design. All I needed from her were her measurements… about a hundred of them according to the book. I recently came to my senses and decided that I should figure out pattern drafting for myself before I move on to others, and I placed an Etsy order for a vintage cape pattern. 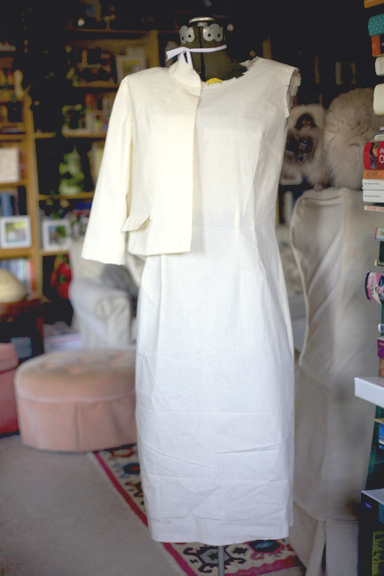 Since the cape pattern didn’t arrive in time for holiday crafting, but Daughter Fish‘s Simplicity 6402 did, I quickly sewed up a very Jackie O muslin as a place holder for my mom. Lucky for me, my mom is understanding. The thoughtfulness of not only a handmade cape but also a gorgeous handmade dress and jacket combo sometime in the coming month made up for the fact that she only unwrapped a muslin on Christmas day. that’s a bang up idea, actually– muslin as prize. then there’s fittings and fabric choices, the gift that keeps on giving! Yeah, it actually went over well. And, I picked up some beautiful fabrics this week when down in Santa Barbara visiting family. I hope to get some good pictures of them tomorrow to show on the blog. So far, my mom seems really keen on everything, but it will be a lot to juggle. She’ll likely get her cape just in time for the beginning of next winter! It looks really good so far! =) Very cool idea to wrap up the muslin until the finished project is ready. I’m glad you all got a chance to get together and that you got to meet the newest addition to our family. She is a cutie. For Christmas I got a gazillion little baby patterns, and I can’t wait to use up scraps of fabric making her tiny little dresses. I wish we could have come back to Virginia for Christmas, but it was nice to spend time with my husband’s family. We do hope to visit soon, and when we do, we’re planning on renting a car and driving your way. It’s about time I introduced my husband to the wonderful spot I spent so many of my summers. Wow! That does look very promising! I’ve got that Patternmaking book, but I find it very overwhelming. Wow, that muslin looks great! I love those seams!